Lightspeed Systems has been filtering schools for more than 20 years, a fact that has positioned the company as a leader in the edtech space. Lightspeed Systems Relay is the only complete 1:1 cloud platform for filtering, managing, monitoring and protecting school networks. Relay Classroom — which easily integrates with the Lightspeed Systems Relay 1:1 platform — leverages machine-learning AI to provide insights into student browsing behaviour. Rather than depend on teachers to identify unusual browsing on sight, Relay Classroom alerts teachers when it happens, zeroing in on students who may be distracted or struggling. Although teachers have the capability to live-monitor student device screens with Relay Classroom, the solution’s alerts free them from that responsibility. LONDON, U.K. — Today, at Bett Show 2019, the premier education conference, Lightspeed Systems announced the first and only comprehensive software platform for school device management. Lightspeed Systems Relay, the market-leading cloud filtering solution for education, is now offered as an all-in-one solution for the filtering, management, monitoring and protection of school devices, with support for every OS, BYOD and IoT. In 2019, school IT departments have more responsibilities than ever. So many tools are required to ensure a 1:1 device initiative is successfully deployed, maintained, and utilised. In the past, IT departments have been forced to purchase multiple solutions for device filtering, classroom management, mobile device management (MDM), and student safety. Not all solutions on the market support every operating system, making management even more complicated and expensive for networks supporting multiple device types. Lightspeed Systems, the leading provider of filtering and MDM solutions for schools, has released a crucial new feature for its Relay device filtering/monitoring solution and Mobile Manager mobile device management (MDM) solution. Admin Roles allows admins of the software solution to delegate granular management roles to other school staff members, allowing easy division of tasks and keeping sensitive student data secure. In school environments, tech directors aren’t the only staff members involved with filter and MDM management. Other tech personnel, principals and even teachers can benefit from the ability to blacklist websites, share reports, and pull device location data. Admin Roles gives admins, aka district owners, the power to delegate specific administrative tasks to other team members without granting them full administrative access — saving admins’ time while ensuring management of devices and data remains centralised. Also cloud-based, Mobile Manager is a device-agnostic MDM built exclusively for education. With support for 1:1 and BYOD, Mobile Manager was developed for education with hierarchal policies, allowing IT to easily assign roles and permissions to all levels of school personnel as well as students. AUSTIN, TX. 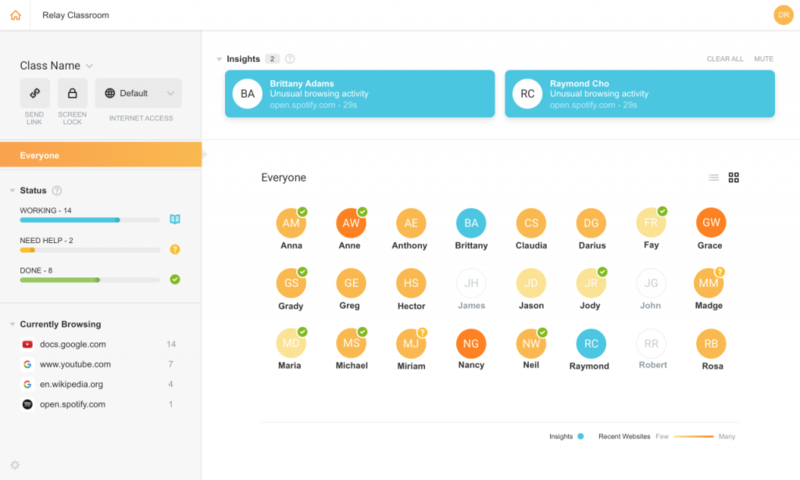 — Ed-tech solution provider Lightspeed Systems, the leader in education device filtering for almost 20 years, has released an update of its classroom management solution for Mac OS. Lightspeed Systems Classroom is now available in general release for Chrome and Mac, with support for Windows on the way. Classroom — which easily integrates with the Lightspeed Systems Relay web filtering solution — leverages machine-learning AI to provide insights into student browsing behaviour. Rather than depend on teachers to identify unusual browsing on sight, Classroom alerts teachers when it happens, zeroing in on students who may be distracted or struggling. Although teachers have the capability to live-monitor student device screens with Classroom, the solution’s alerts free them from that responsibility. AUSTIN, TX. — Today, Lightspeed Systems announced the general release of its Smart Agents for Mac OS, iOS and Windows, bringing multi-OS support to its school filtering/monitoring solution, Relay. These revolutionary, patent-pending agents — which provide seamless SSL decryption and mobile filtering to student devices, and have previously supported just Chrome OS — are available to Relay customers now. Schools are implementing one-to-one programmes in record numbers, and school IT departments are responsible for the daunting tasks of filtering students’ internet access on these devices as well as identifying suspicious online activity, locating lost devices and more. Complicating matters is the wide array of devices in individual schools: tablets, laptops, desktops and smartphones, often on a variety of operating systems. New case study reveals how Lightspeed’s device filtering/monitoring solution helped Nevada school district identify students at risk of suicide. There are more devices in schools today than ever before, but IT departments need to maintain control of those devices to keep students safe and focused on learning. The cloud-based, multi-OS Relay eliminates the need for multiple systems to filter, monitor and manage school devices with features for granular user activity reporting; content filtering, including SSL sites, with flexible policies; real-time suspicious activity alerts; and geolocation for lost and stolen devices. And all these tools are available in a single, streamlined UI. Shortly after implementing Relay, Nye County School District Director of Technology Robert Williams used the software to pinpoint students in trouble. “Within the first week, we identified two students in one of the schools that were researching a suicide hotline,” Williams said. Using information surfaced by Relay’s Flagged Terms feature, Williams passed the news along to the school’s principal, who intervened to help both students, potentially saving their lives. Relay made headlines last February when Lightspeed announced the release of Threat Check, a Relay feature that provides schools with information that can help identify high-risk behaviours and prevent school violence, self-harm, bullying, and more. School personnel can flag high-risk students and input offline activity such as violence, threatening speech, or bringing a weapon to school. This synthesised insight gives schools a more holistic picture of potential threats, as well as indicators of when high-risk students are escalating toward violence. To learn more about Lightspeed Systems Relay, visit www.lightspeedsystems.com/relay. To read the case study, visit https://bit.ly/2L5hyYm. Education technology company Lightspeed Systems announces the availability of its patent-pending Smart Agents for Mac and Windows, with iOS support on the way. AUSTIN, TX. — Today, Lightspeed Systems announced the release of its Smart Agents for Mac OS and Windows, bringing multi-OS support to its school filtering/monitoring solution, Relay. These revolutionary, patent-pending agents — which provide seamless mobile and SSL filtering to student devices — are available in beta to Relay customers and will be released for iOS in subsequent weeks. 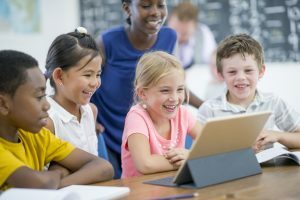 Schools are implementing one-to-one programs in record numbers, and school IT departments are responsible for the daunting tasks of filtering students’ internet access on these devices as well as identifying suspicious online activity, locating lost devices and more. Complicating matters is the wide array of devices in individual schools: tablets, laptops, desktops and smartphones, often on a variety of operating systems. The cloud-based Relay eliminates the need for multiple systems to filter, monitor and manage all those devices with features for granular user activity reporting; content filtering, including social media and SSL sites, with flexible policies; real-time suspicious activity alerts; and geolocation for lost and stolen devices. And all of these tools are available in a single, streamlined UI. Lightspeed has honed its proprietary database — the core of its web filtering products, Relay and Web Filter, designed for education — over almost 20 years. AUSTIN, TX. — Ed-tech solution provider Lightspeed Systems, the market leader in device filtering, achieved a new milestone today as its URL database hit 65 million websites. Lightspeed Systems’ proprietary database of sites categorised for education powers Lightspeed Systems Relay, a cloud-based device filtering/monitoring solution for every operating system, and the Lightspeed Systems Web Filter, a multi-OS device filtering solution with multiple deployment options. Lightspeed Systems has carefully cultivated its database since the company began filtering school networks in 1999. Lightspeed’s database uses a combination of artificial intelligence and real-time analysis to categorise websites, but AI alone can’t accurately read images, videos and foreign languages. Thus, its database also leverages a combination of human and robot teams to categorise the web in order to ensure schools using its filters are giving safe, appropriate access to students. Its 65 million websites are organised based on what is suitable for children and for educational environments. Relay and Web Filter can also block new, unknown URLs until they are categorised, giving Lightspeed another edge on competing products. Additionally, Lightspeed has categorised approximately 90 million YouTube videos to give students safe access to streaming video and block bad content; this feature, called Smart Play, can be enabled in the Relay or Web Filter with the click of a button. Relay gives the ability to filter any device OS by deploying Lightspeed Systems Smart Agents. It also features Classroom, a classroom management solution that leverages machine-learning AI to provide insights into student browsing behavior; simple SSL filtering; a Parent Report Generator; and the aforementioned Smart Play, a YouTube management feature. To learn more about Relay, visit www.lightspeedsystems.com/relay2. Education technology company Lightspeed Systems has released its multi-OS filtering and monitoring solution for purchase online. AUSTIN, TX. — Today, Lightspeed Systems made its new educational filtering and monitoring solution, Relay, available for purchase in Amazon Web Services (AWS) Marketplace. Lightspeed’s multi-OS Software-as-a-Service solution was built to help school IT departments filter, monitor, report, and locate school-owned student devices. There are more devices in schools today than ever before, and IT departments need to maintain control of those devices to keep students safe and focused on learning. The cloud-based, multi-OS Relay eliminates the need for multiple systems to filter, monitor, and manage school devices with features for granular user activity reporting; content filtering, including SSL sites, with flexible policies; real-time suspicious activity alerts; and geolocation for lost and stolen devices. All these tools are available in a single, streamlined user interface. Lightspeed Systems announced Relay 2 at London’s international ed-tech conference BETT in January. Version 2 includes features such as simple SSL filtering for every OS; a Parent Report Generator; and Smart Play, a YouTube management feature powered by machine learning. Built on AWS, Relay 2 allows Lightspeed to stay ahead of resource demand by adding capacity on the fly and build out instances around the world to meet the needs of the company’s global customer base. To learn more about Lightspeed Systems Relay, visit www.lightspeedsystems.com/relay2.